I was talking to a friend of mine today about home improvements. He’s working to rehab his bathroom while the Retire29 household is finishing our basement. Every homeowner has been in our position, and it’s usually a costly one. In 2013, the average homeowner spent $4,000 on home improvement costs. No doubt, some of that was spent on labor, but far more was spent on the actual materials: appliances, landscaping, lawn care, flooring, siding, tools and equipment. This list is endless. My friend spoke specifically about an impact driver he bought from Home Depot a couple days ago for $280. Being a reasonably smart person, I was surprised to find out he paid close to retail price for the purchase. I’m here to tell you, there is a better way. With about 11 minutes of internet work, you will never again pay retail prices at home improvement stores. Far from it, actually, as you can easily save 19% off of every purchase you ever make at these places. I’ve previously extolled the virtues of using secondhand gift cards for as many retail purchases as you need to make. However, it’s understandable that the small legwork of acquiring the gift card might not be compelling for small transactions. Such is not the case, though, for home improvement projects. You’ll often find yourself tapping huge amounts of funds for construction materials, tools, and supplies. For these large transactions, taking a few commercial breaks of time to save upwards of 19% on, say, $1,000 in purchases (any amount works), makes tremendous sense. The few minutes of time it takes will be one of the highest value-for-time exchanges you ever make in life. Full disclosure, I’ve done this many times and will continue to do it. It’s not hard. Here are the steps; done in order, you’re looking at 19% savings. TopCashBack. TopCashBack is a online shopping portal that gives you cash back for purchases made through one of their referral links. It’s like eBates, but with better rebate amounts. Raise. Raise is a discount gift card reseller. Using this link will get you $5 off your first purchase. Cardpool. Cardpool is another reseller. Exact same model as Raise, but different merchants will have different discounts; its best to have accounts at both sites. Using this link will also get you $5 off your first purchase. Step 2 (1% – 2% Savings): Using TopCashBack’s Portal, navigate to Raise (1% back) or Cardpool (2% back). Now, your TopCashBack account will be credited 1-2% of whatever you go on to purchase. Step 3 (6% – 9.3% Savings): When you arrive at Raise or Cardpool, find the merchant you will be shopping with, Lowes or Home Depot. Depending on which which you use, the discount on the gift cards will vary. Current discounts on Home Depot cards are 6% and 6.5% and Lowes discounts are 8% and 9.3% (at Cardpool and Raise, respectively). Buy a gift card(s) for however much you think you’ll need. Even after you use the coupon, it still may have value. 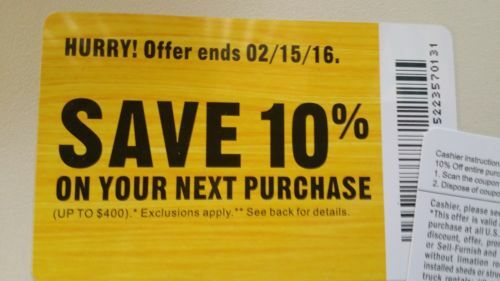 Used coupons are often listed on eBay and tend to say something like, “Good at Competitors.” Most all Home Depot and Lowes stores will accept the competitor’s 10% off coupon. In fact, even stores like Harbor Freight, Menards, and ACE Hardware sometimes accept these competitor coupons. My sister and brother-in-law own an ACE Hardware, and they don’t accept the cards, so it’s best to check with the store. You can actually get one of these coupons from Lowes for free by registering here for a “Movers Discount.” It will ask you for the date you’re moving, so if you have an aversion to making stuff up, then you might just want to buy one. Step 5: Go to your location and buy whatever you want. Present them with the 10% Off coupon at checkout, and then pay with the gift card you receive from Cardpool or Raise. Easy peasy. Rather than lose you in the weeds that follow, I’ll point out right now that what I’ve detailed above is all you need to know if you want to play this at home. However, if you’re feelin’ sporty, there are a few ways to make this even more lucrative. Yeah, baby! You could also combine this with good old fashioned Credit Card Hacking to really stick it to the man. When you make your gift card purchase (using a credit card with an introductory reward), you’re probably getting an extra 20-30% back in travel rewards. Not too shabby. If you’re a Veteran like me, sometime during your November 11th food bender, you can stop by Lowes or Home Depot and collect a cool 15% off all purchases. You can completely forego the 10% coupon and get an even bigger discount with a quick flash of your DD214. If you’re into an extra 3-5% cash back… Rather than making your purchase in-store, make your purchase at Lowes (3%) or Home Depot’s (5.1%) website, once again using the TopCashBack portal to access the website. Simply do “Free In-Store Pickup.” Granted, not all things are available online, and most of us DIYers might enjoy going around the store in-person. However, if you’re buying an appliance, this might more a lot of sense. I’ve used this trick many times, and will continue to do so as we finish our basement. It works, and once the “Step 1” accounts are set up, the exact same methodology can be applied to most every retailer that has a gift card program. Good luck to you, and let me know in the comments if you have any questions! Thanks for reading Retire29! And if you enjoyed this post, help me out and Share it on Twitter. If you want these posts straight to your inbox (along with a healthy dose of spam, just kidding), then you can subscribe right here. I save 100% by not shopping at Home Depot or Lowe’s. As a shareholder of Lowe’s, I would encourage people to shop there more however. Dividend Growth Investor recently posted…Should Dividend Growth Investors Dip into Principal? Well played, Sir! Of course avoiding the purchase altogether is always the cheapest route. However, most of us will have the occasion to buy some lumber, or a light fixture, or a garbage disposal, at some point during our lives. When we do, it’s nice to save a ton of money! Great way to save a little cash, thanks Eric! Steve Miller recently posted…Is the Tiny House movement for you? Thanks for pointing that out. Maybe max of $2,000 if both you and your spouse get a TopCashBack account? Yes once you set up everything, it is a pretty good discount to have. Thanks for sharing, and hopefully you wont spend 4K this year on home improvements. 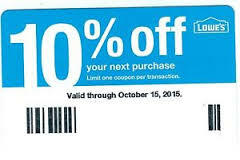 Yes you can use the lowes 10% off coupon on non sale or non promotional items. You should use the chat as you check out so they can verify the coupon. I was not aware of the TopCashBack site. An extra 5% at Lowes would have been great with all I have spent for an upcoming home remodel. Better than the Lowes 10% off are $15 off $50 (30%) and $50 off $250 (20%) Lowes coupons available on eBay. 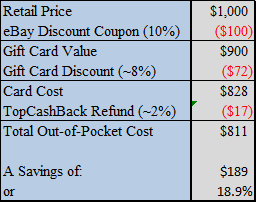 I manage my purchases to get as close to the $50 and $250 as possible to maximize the percentage savings each time. I have been buying gift cards as well to increase savings. I will look at buying them through TopCashBack for extra savings. Thanks for the tips. will lowes honor the ebay 10% coupons on top of my military discount? We have been terrible burned by Lowes trying to get our bathroom remolded and it has been a nightmare since March 2018. We are still without a master bathroom and had to fire the contractor they gave us because of the poor workmanship and many many errors in the orders that were wrong and so many other issues. I have 3 Quic coupons that I need to use up from Lowes and I hate to go back there. Will Home Depot be kind enough to take these coupons I paid for?